Many RV’ers presently rely on their GPS or Internet maps, but unfortunately, these are not always up to date or reflect the best route for an RV. By following the below driving directions, access to the Branson Lakeside RV Park is very easy with little or no traffic, hills, narrow roads, or sharp turns. When coming to the Branson Lakeside RV Park from the South via Hwy 65, take the second Branson exit at Branson Landing Blvd. and Hwy 248. Turn right (east) and continue until you enter a roundabout (circle). Exit the roundabout on Branson Landing Blvd. (the third exit), move to the left lane, and continue past the Branson Landing shops approximately two blocks into the park. 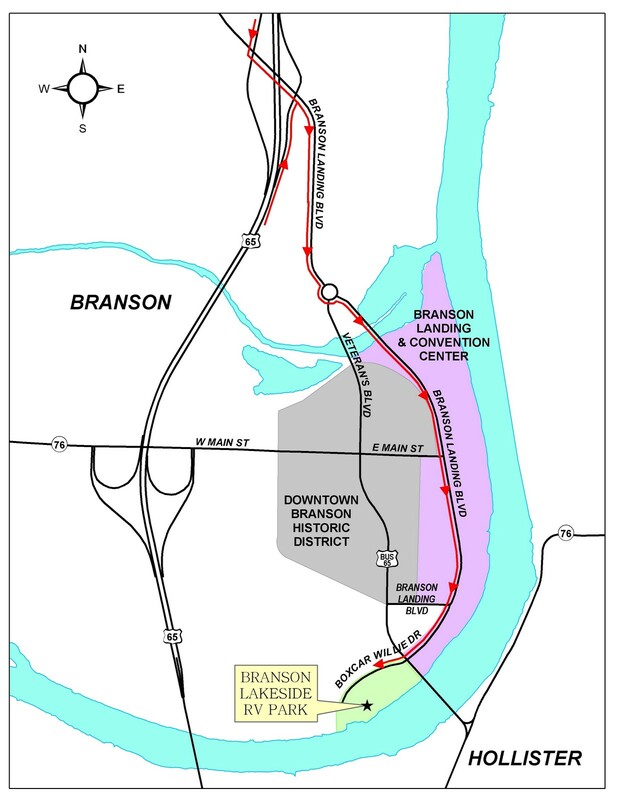 If coming from the North via Hwy 65, take the second Branson exit at Branson Landing Blvd. and Hwy 248. Turn left (east) and continue until you enter a roundabout (circle). Exit the roundabout on Branson Landing Blvd. (the third exit), move to the left lane and continue past the Branson Landing shops approximately two blocks into the park.